In a marriage made while perched precariously on the lowest rung of infernal perdition in the very cancerous bowels of hell itself, the UK's finest young rock & roll band and this country's premier spoken word, synth pop hauntologists have officially joined forces. 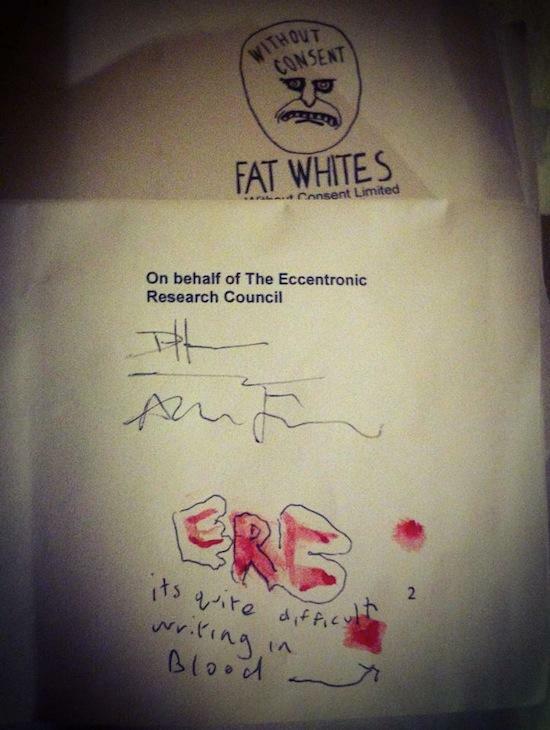 Late last week the Eccentronic Research Council signed a record deal to produce an EP and an LP on the Fat White Family's Without Consent label. Both parties have confirmed that the Fat Whites first became aware of the ERC after Champagne Holocaust ended up being chosen by that group's Adrian Flanagan for his Baker's Dozen feature for tQ. When did you first become aware of the Fat White Family? Adrian Flanagan: I first became aware of the Fat White Family after reading an album review of theirs in spring 2013. It said they were awful, tuneless, talentless oiks, or something to that effect. I bought Champagne Holocaust immediately based on that review. It's a great album, with great lyrics. I like that it sounds like it was recorded over a few years in different places, in different studios, on four-track machines or straight to cassette. I like records that jerk the meditative element of the listening experience, by changing the environment of the sound. 'Cream Of The Young' is an incredible track. The FWF are the only other 'non urban' band, bar us, and say Sleaford Mods, who are reporting back from the front lines of this 'depressed Isle', back to planet ignorant, on the hideousness of what's happening around us. Be it mucky south London, satanic middle England, or right at the heart of the sleazy British media. At the same time, looking like total dapper twats [laughs]. What was it like when you first saw them live? AF: A pal bought me a ticket to see The Fall in London last November, so I went down and stopped for the weekend. The Fat Whites were playing the 12 Bar Club while I was in town, at the Antifolk Festival all-dayer, so I went to see them. The small audience intrigued me first, it seemed to be made up of total loons, degenerates, drunks, drug addicts, prostitutes… my kind of people [laughs]. Almost as soon as we walked in the venue, we were approached by the legendary Patrick Lyons, who ranted at us enthusiastically, like he was the band's proud eccentric father. By the time the band went on after midnight, I was totally 'vibing' on the lunacy all around. I think the drummer hadn't turned up so Adam [J Harmer] the guitarist played the drums, organ player Nathan [Saudi] played the show lying on his back, using his chest as a keyboard stand and Saul [Adamczewski], Lias and Joe [Pancucci] just looked and sounded like a bunch of demon-eyed cowboys, wired and weird. The music hit me straight away, it reminded me of so many things, but I loved it immediately. I got the same feeling seeing them as I did when I saw The Smiths as a 13-year-old and The Fall. You just know they are special. I think they have the ability to bring the revolution to the cripple-arsed corpse that is rock & roll, if they manage not to kill themselves or each other in the process [laughs]. AF: During the usual end-of-year music magazine/blog round-ups in 2013, I was asked by journos/blogs, etc. for my favourite albums. I mentioned the FWF in a few of those. I forwarded a few of these on to Saul from the band who I was corresponding with at the time as we both have a mutual love for weird country records and music from 70s Thailand. He reminds me a lot of myself when I was a youth does Saul; he's wayward, disconnected and has a fire in his belly. He's older than his years. He's a good guy, a brother. I think the precursor to us actually getting together was when the whole band had seen the Baker's Dozen I did for you fuckers, earlier in the year. Saul then invited me to hang out with them in Sheffield at their now legendary show at The Harley. I think I may have been the one, who, pre-show, encouraged certain on stage 'smelly' behaviour after mentioning G.G. Allin [laughs]. After the show, we properly bonded, they seemed to like having me around. The following day they asked me to come to their Manchester show with them, after that they invited me to DJ a few times at their Slide In nights across the UK. I became part of the Family. Lias Saoudi: We saw Champagne Holocaust in Adrian's Baker's Dozen list. Having gotten over the initial shock of appearing on such an esteemed list, we made plans to hook up in Sheffield where we were heading on tour. That particular show was steeped in a kind of malevolent shamanism, the like of which I had not experienced before. There was something wretched in the air; something Adrian Flanagan was clearly enjoying. Needless to say we hit it off immediately, and discovered in each other a dark passion for the mystical capacities of popular song, as well as a common adoration of needless and excessive depravity. What was working with them like and what was the project? AF: It was a total joy. Saul and Lias came up to Sheffield a few times over the summer to collaborate on a few tracks that Dean [Honer] and I had been working on - tracks that are part of a fictional group we call The Moonlandingz, about whom our next ERC 'concept album' centres around. We just drank a lot. I locked 'em in my back room with some B&M bargain party snax and encouraged them, with a slightly malevolent but chirpy elderly person's tone - not to mention a horse whip - and a demand that they "bloody get on with it". [laughs]. We got two rough song ideas down at mine, one that sounds a bit like Future Days-era Can but with a massive pop chorus and with 'mucky' lyrics. Another has got that psychedelic Gainsbourg groove like 'Requiem Pour Un Con' with weird fairground organs on it and a Beefheart-esque slide guitar. We then went for a curry, came back at midnight, I taught them a little campfire 'singalong'-type song I'd written just before they arrived that day on a old Optigan keyboard. We went through that a few times, had a few hours kip, then went to our Dean's Bowling Green studio and recorded everything properly. During that session we also did a 15-minute live, made up on the spot track with a drum machine, with Dean and I on synths, Saul's fuzzed-up guitar plugged into a synth and with Lias screaming and chanting over the top of it. Dean and I chopped that up and made a track out of that too, so we got four tracks out of that one session. LS: Adrian and Dean had sent us a brief about their psych act the Moonlandingz and some tracks they wanted us to work on some time before we headed up to Sheffield to record. Once we got up there and into Dean's studio we worked really quickly and it all came together pretty naturally. We were so efficient in our collaborations, in fact, that there was even time for a curry and a trip to the pub. When did you first hear about the Without Consent label? AF: Right from the start really. Obviously I'd been working pretty closely and socialising with Lias and Saul, and once they heard the finished tracks that we'd worked on and the actual concept LP, they said they'd like the opportunity to make this record their first signing, and to release it themselves. Which for us, being pretty DIY and haphazard in our release approach, meant less cardboard in my front room, less trips to the post office, a better chance of the records being found in shops across Europe and taking the Eccentronic Research Council music to a crowd that might not have heard of us before. Hopefully younger, less beardy, baldy and portly people. Fewer grumpy smart arse musicologists. People more open to having their minds blown by cerebral imaginative music. Tell me about the signing ceremony. AF: It was just Dean and I, one quill and a surgical needle. I wanted to sign the contract in blood, so stabbed myself in a couple of fingers a few times with a needle. The only problem was, I stabbed my quill-holding fingers so it was both messy and too painful to write with, I also felt faint because of the blood so I ended up just writing the initials E. R. C..
What are you going to release on the label? AF: We are contracted to do an album and an EP. We will be putting out our ERC/Fat Whites collaboration - our fictional outsiders supergroup EP - first, closely followed by an interconnecting 22-track Eccentronic Research Council concept album, as per usual, featuring narration from the very brilliant Maxine Peake. The album also features Lias and Saul. It's the best thing we've ever done, while still being pretty off the wall. We've done a video for the lead track of the EP featuring the fictional band, which Maxine stars in. We hope to get that online mid-December, followed by the EP/LP early 2015. It amuses me no end having Saul and Lias as our CEOs. When Lias visits me, he takes me for fancy coffee flavoured cocktails. "I'm your CEO now Adrian, whatever you want, you can have" he says to me [laughs]. LS: The album - planned for release in late January 2015 - tells the story of a stalker obsessed with the lead singer of a highly unsuccessful local psych act called Johnny Rocket. Based on personal experiences the part-musical, part-spoken narrative deals largely with the theme of all-encompassing and destructive narcissism in a mind gone desperately wrong. The music for the fictional band is where the Fat Whites come in - we recorded an EP of material making up the oeuvre of Johnny Rocket and his Moonlandingz.